Down to Earth Project is a social enterprise specialising in Sustainability Education and Natural Building. Based on a beautiful site on Gower, they offer a range of groundbreaking programmes for ‘disaffected’ young people and training programmes for adults in Traditional and Natural Building methods. As a centre for Sustainability Education (ESDGC), they offer educational programmes and training for workers from informal and formal educational sectors. They also work with schools and community organisations to design and build beautiful outdoor spaces using natural materials. 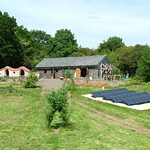 They have a woodland organic garden which is used to educate participants and volunteers in sustainable food production. They hold regular volunteer days open to the wider public in gardening, land and woodland management. Also a part of the Swansea Sustainability Trail. 72a Manselfield Road, Murton. SA3 3AP.